The BTD-1 Destroyer is a premium rank III American naval bomber with a battle rating of 4.3 (AB) and 4.0 (RB/SB). It was introduced in Update 1.33. 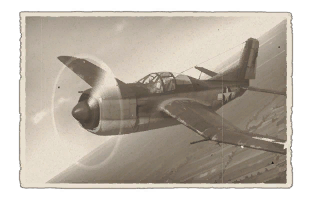 The BTD-1 is a single engine dive bomber and torpedo bomber and can carry a very wide array of explosive ordinance. This plane can be used effectively against both ground and naval targets. "The Destroyer" can reload on either an aircraft carrier or an airfield. 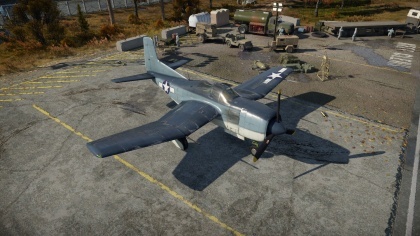 It can also be utilized as a bomber hunter, using the air spawn (on non-carrier maps) and it's twin 20mm cannons to shred stray bombers. Destruction of the enemy fleet forces. Fast for a carrier based bomber. Comparable to the B7A2 in terms of playstyle and roles. Great choice of additional armament for it's tier and size. Above average turn rate when at higher altitudes and with less load. Easy to land, especially with the help of air brakes. Can drop bombs both when flying horizontally and when diving. Airframe can withstand high speed dive. All bomb payloads are carried internally. Gets an air spawn and can perform a bomber hunting role. Very good SL and RP maker. Less responsive handling at low altitudes. Bombs and torpedoes limit the plane's maneuverability. Compresses heavily at high speeds, causes many accidents. Negative G maneuvers cause elevator to lose effectiveness for a couple seconds, can cause crashes if performed at ground level. Only twenty eight aircraft were produced. Production was cancelled due to the surrender of Japan, the plane never saw combat because of this. Notice the offset vertical tail section to counter the torque. It works like a fixed rudder trim.